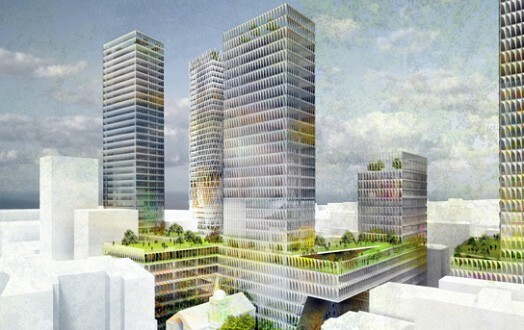 Will Renzo Piano’s new tower demolish an ancient city buried under Beirut? Venice? No, it’s all in Lebanon! Highway closed for no reason? What exactly did the Iranian advisor tell Hariri? 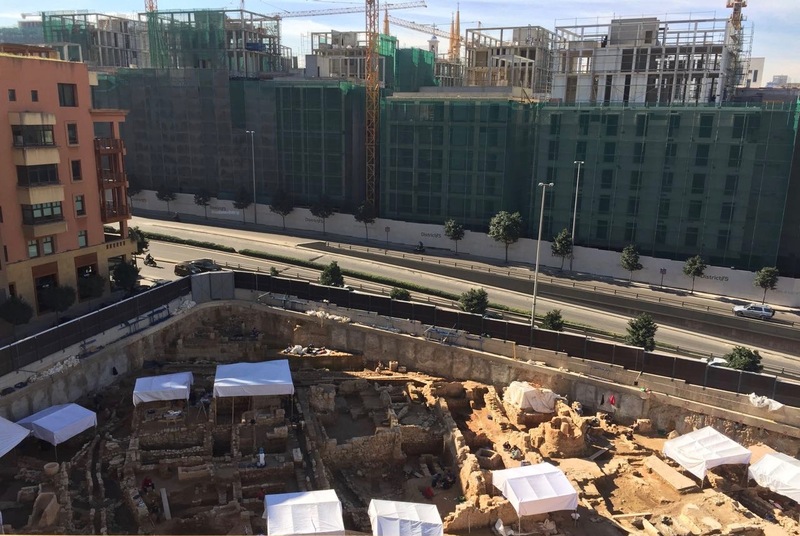 Home Tags Posts tagged with "Downtown Beirut"
Archaeological excavations have been mushrooming across downtown Beirut over recent months, providing a glimpse at how the city looked and functioned in ancient times. 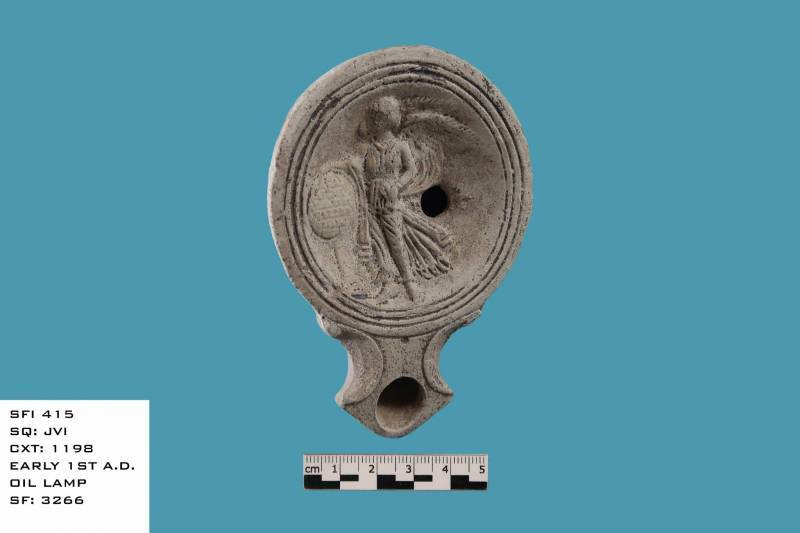 Among the finds is a first century wall, structures related to roman pottery workshops, well preserved ovens for tile-making, storage silos and vases for transporting oil and wine, a large pond (a possible rare public laundry pool) and a temple for the worship of Minerva, patroness of artisans, according to the article. 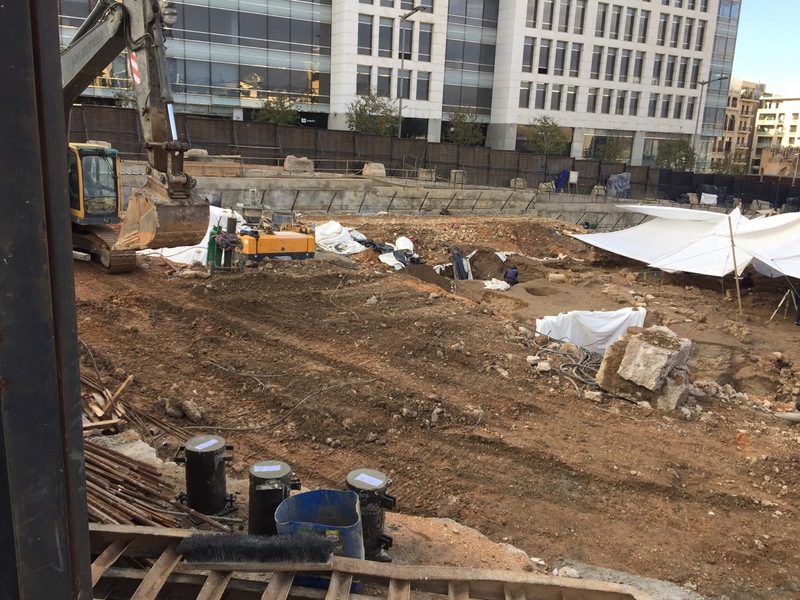 The L’Orient article noted that excavations could go on “until 2018” – does this mean a decision has been taken to dismantle and destroy the site as it appears here? 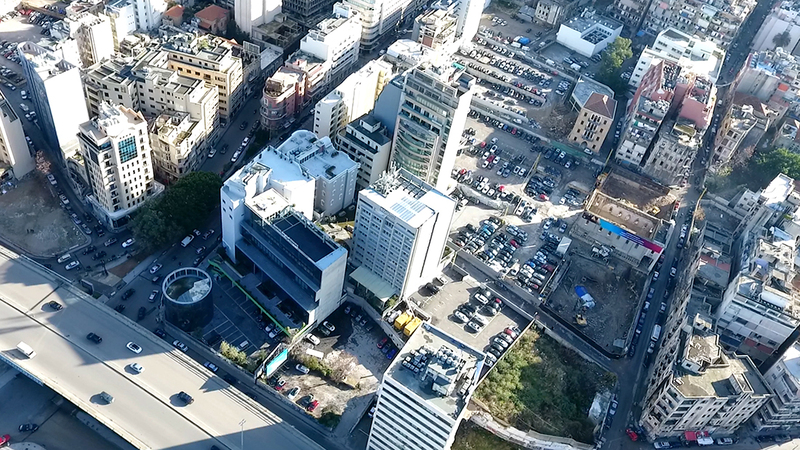 After all the piece of land is owned by SGBL Bank, which plans to build a new headquarters tower here, designed by Italian starchitech, Renzo Piano. 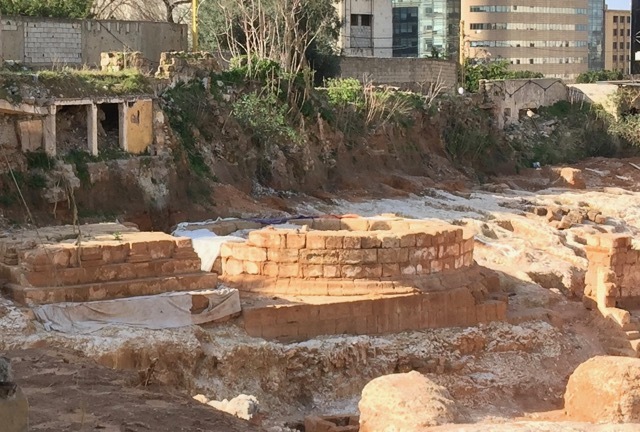 Just a few blocks away, Piano, who seems to be doing well in Beirut (with hundreds of millions of dollars of projects across the city), has also designed a long awaited Beirut archaeology museum, delayed for over two decades since its announcement in the 1990s. It is to be built near the An Nahar building, yet ironically, archaeology was discovered while constructing this archaeological museum. 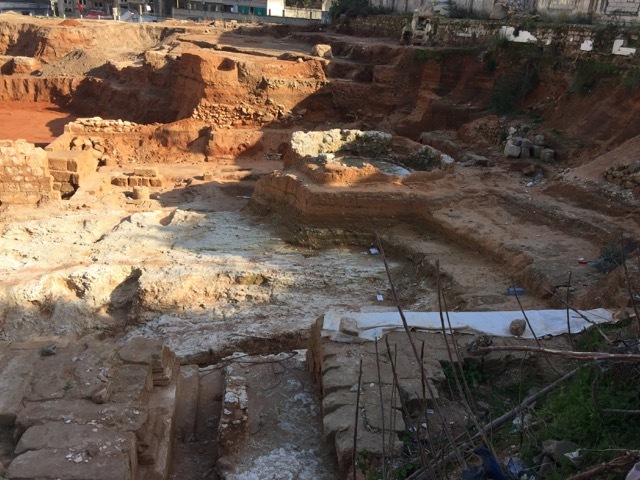 Finally, a new excavation has just got started also in the Saifi area, not far from previous excavations at the Paul restaurant in Gemmayze. 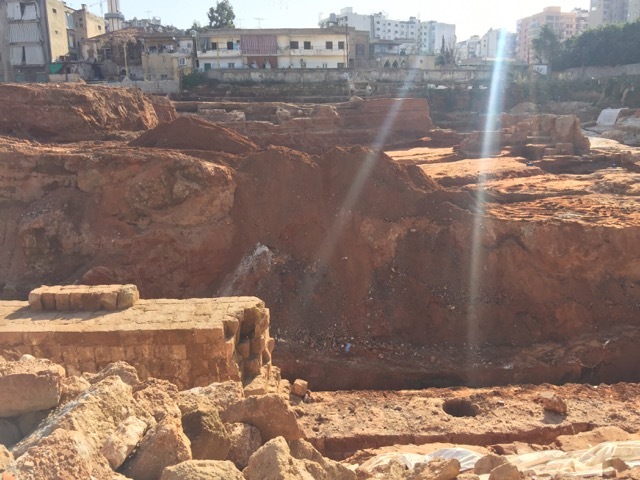 The site is also across the street and a block up the road from the Saifi Plaza construction site, where a number of ruins also discovered, but have since been cleared away. 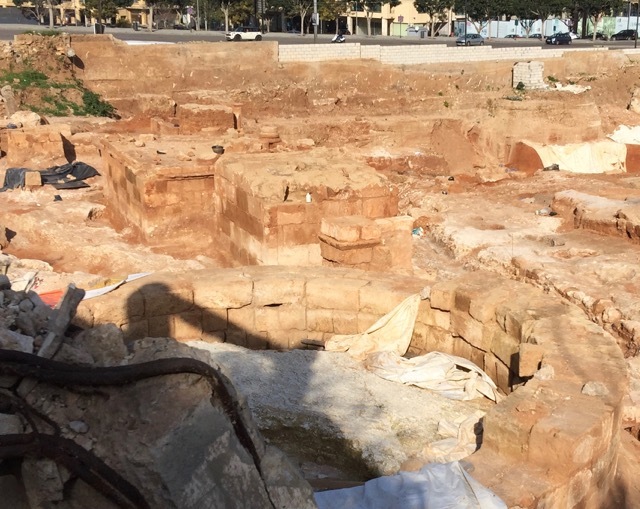 In fact, it is the proximity to other excavations which helps us better understand these sites, fill in blanks and provide a global view of ancient Beirut and its many layers of history. However, increasingly many of these sites are being wiped out, replaced by lucrative real estate projects, tied to political and business elites. 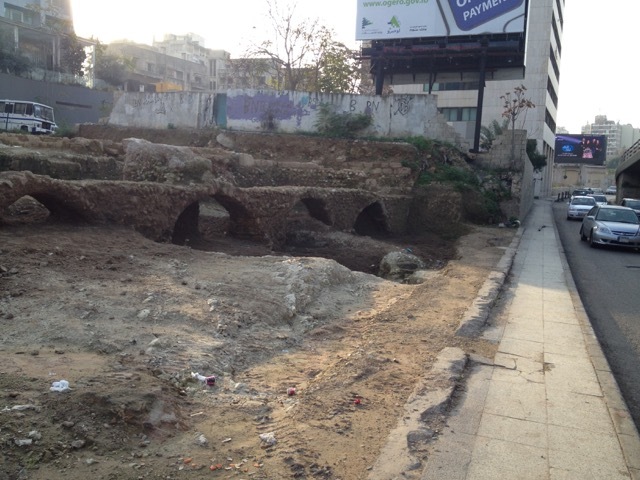 Sites that have already been wiped out include the famous chariot race track of ancient Roman Beirut, a site believed to have been a Phoenician era dry dock (potentially one of the world’s oldest shipyards) the remains of Beirut’s Roman theatre, as well as Hellenistic neighborhoods and other sites, including one in which I was assaulted by multi-million dollar developers for merely trying to take a photo of ruins on site. I’ve created a quick map showing the three new excavations detailed in this post and how the relate to other nearby excavations that I have covered previously, both those that still exist as well as those that have been cleared and built over. 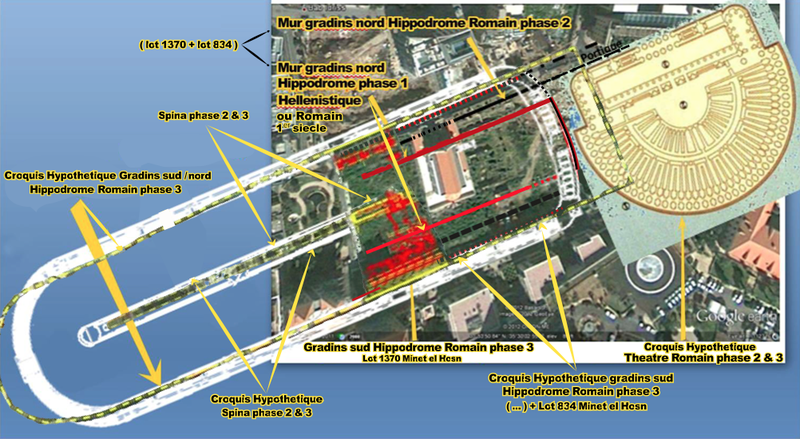 –The sites in red are the three new and ongoing excavations detailed in this post. 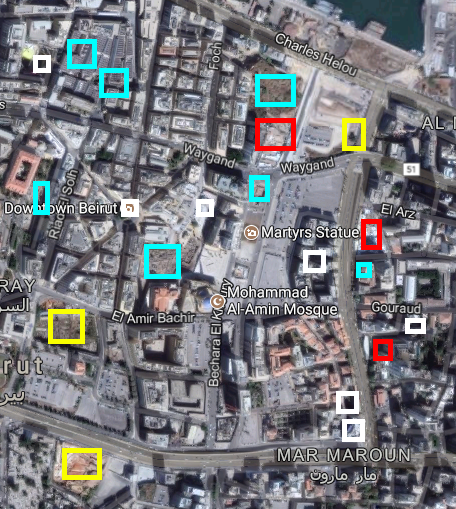 -The sites in yellow are recent excavations whose fate remains unclear. -The sites in blue are previous excavations that are currently on display, but with limited access or explanations. -The sites in white have already been cleared and no longer exist. In fact even the few sites that have been preserved contain no signs or information detailing the discoveries to give the public a chance to appreciate them. 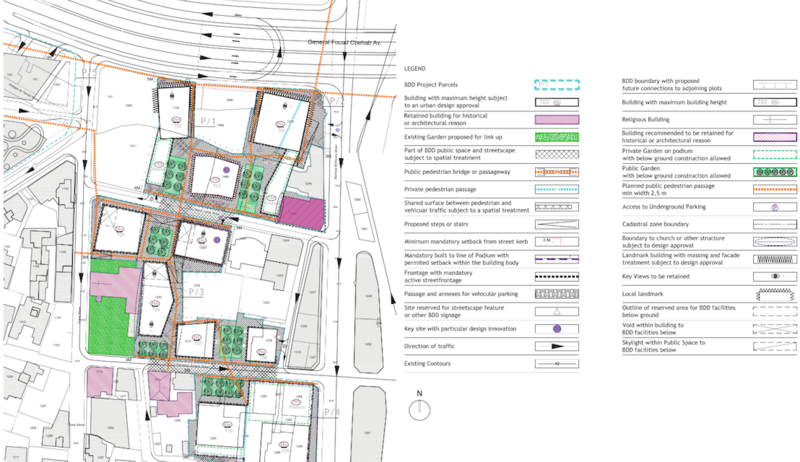 And note this map is only a glimpse of a wider reality in the city limited to sites I have personally witnessed or reported on in the last six to seven years. 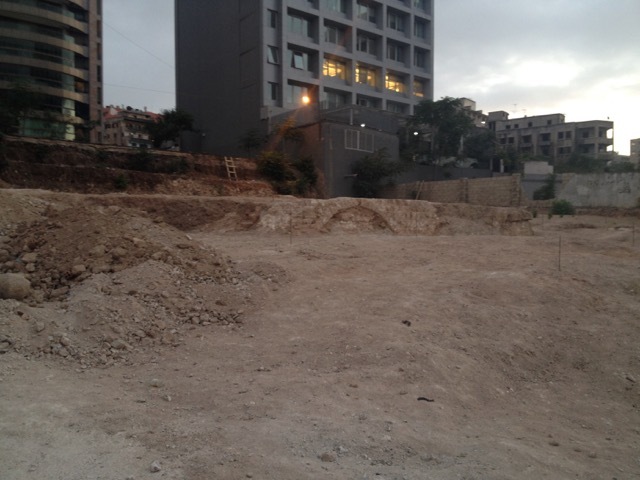 There are tons of sites just east of this map in the Ashrafieh neighborhood, as well as on the western side of downtown, such as the aforementioned demolished Beirut Roman Chariot Race track and Phoenician port site. 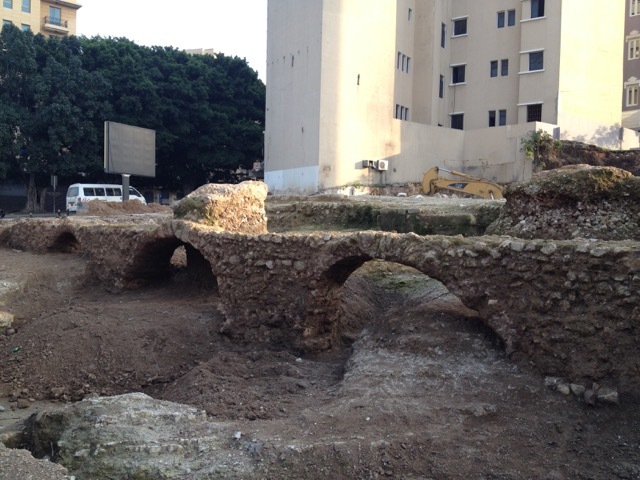 Meanwhile the fate of many recently excavated sites such as the Roman Gate ruins at Riad Al Solh and the (royal?) 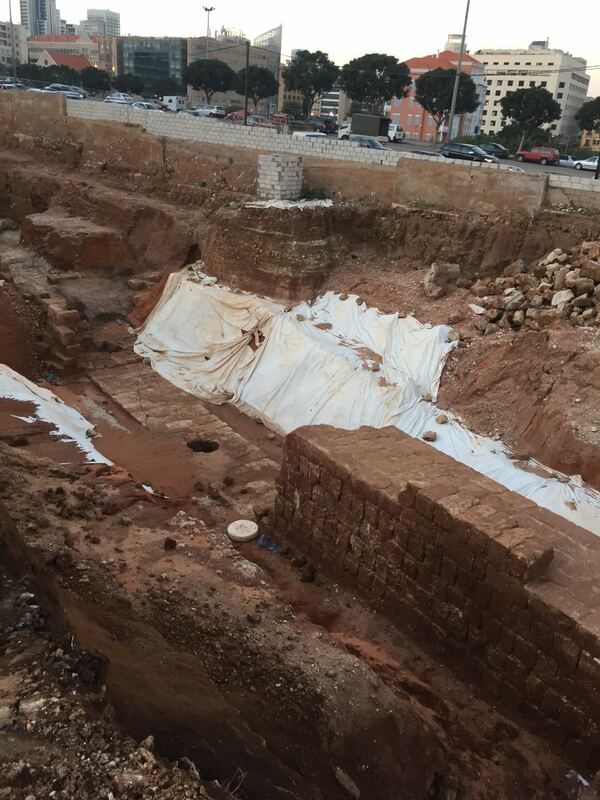 Roman cemetery on the Beirut Digital District property remain uncertain. 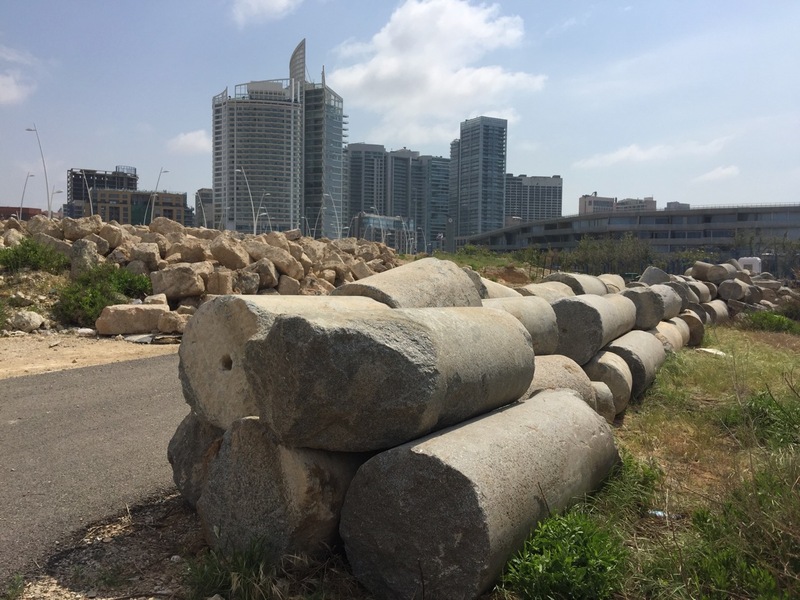 Across the city and the country, dozens if not scores of archaeology sites have disappeared over recent decades, in favor of new high rise towers. 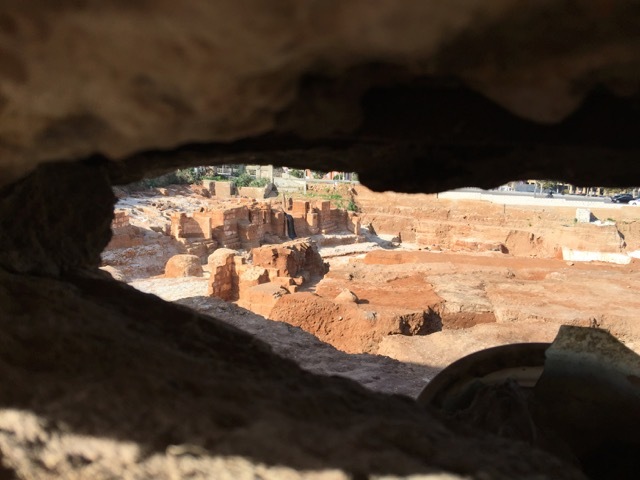 Stay tuned for more of our continuing coverage on archaeology in the city, what stays, what goes and who decides the fate of our historic spaces. Hint: It has a lot to do with money, power and real estate. 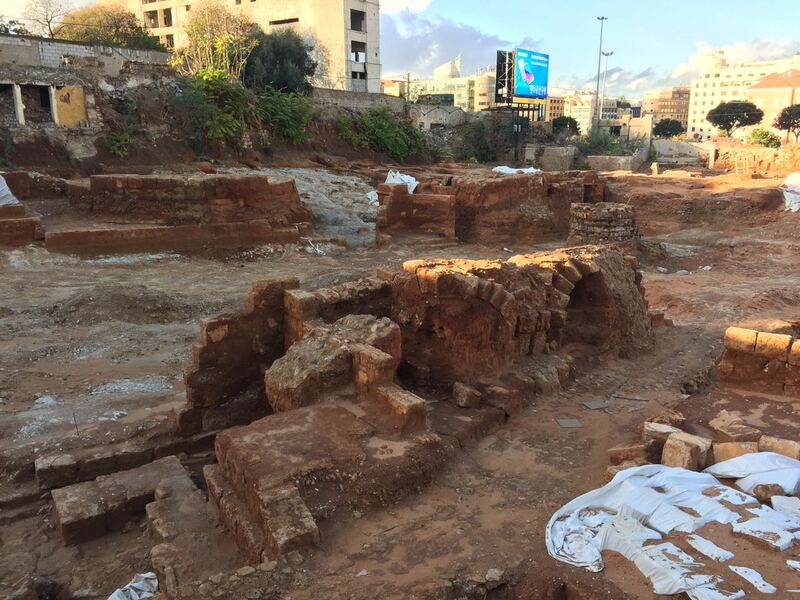 How did ancient Beirut get tossed in a pile? 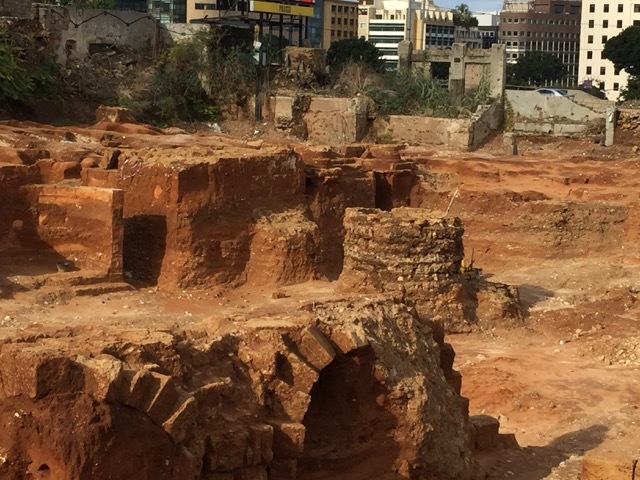 In the shadow of the towers of new Beirut, the ruins of ancient Beirut have literally been dismembered and piled up at the edge of town. It may be hard to believe today, but ancient Berytus was a very prominent city in the Roman empire, one of a handful of Roman cities to contain a law school, which played a key role interpreting and producing the cannon of Roman law, foundational to legal systems across the world today. Did these columns come from the law school or did they come from the famous chariot race track of Berytus that once hosted 1,400 gladiators in a single day? Or did the columns belong to the city’s Roman theatre, its baths, churches, gates or colonnaded roads? The sad answer is we don’t know and we may never know. 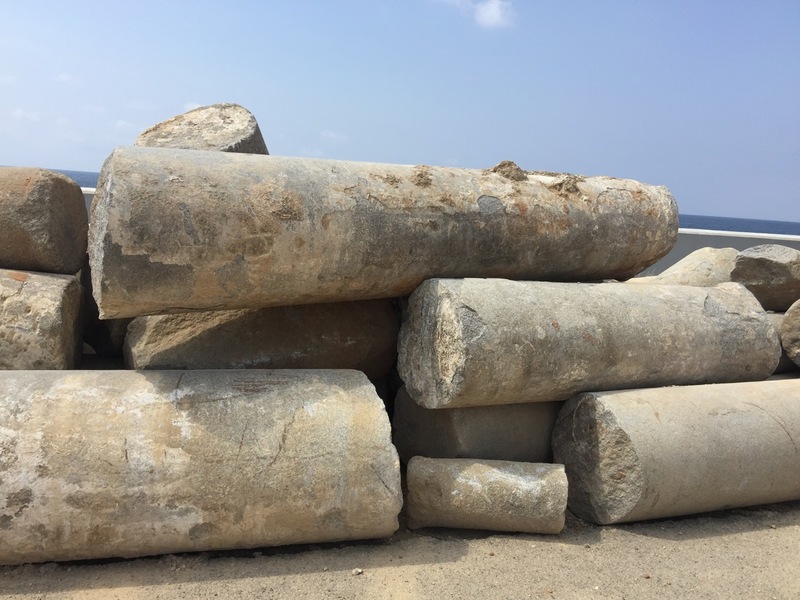 Piecing together the story of these columns and the spatial history of the city may now be impossible according to a source with the Directorate General of Antiquities (DGA) quoted in L’Orient Le Jour, which broke this story a couple of weeks ago. So how could this happen? 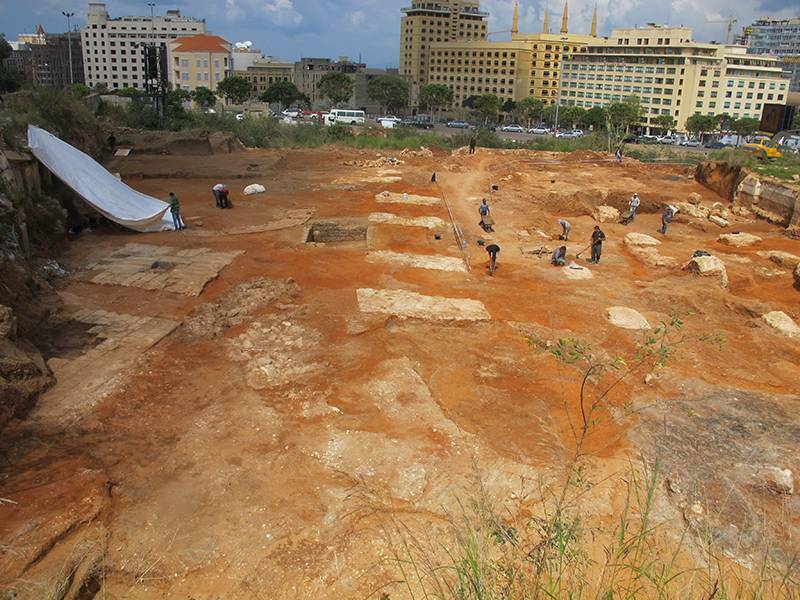 In the 1990s, Beirut was reportedly the biggest archaeological site in the world, with teams from universities across the globe working in its trenches. I had a closer look at the ruins last week after blogger Elie Fares pointed the site out, following up on the L’Orient piece. 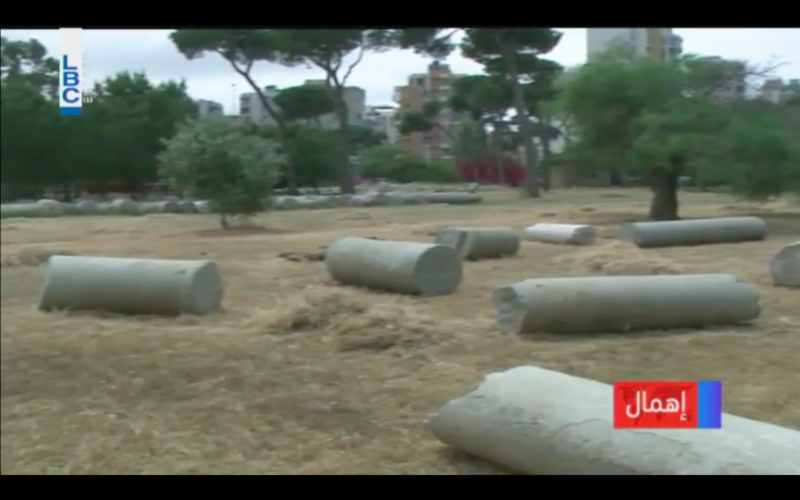 Yet all this seemed uncontroversial to the new culture minister, Ghattas Khoury, who noted that the columns were “well-organized” and “monitored” by the Ministry of culture and “everything is proper and well-preserved,” as he said in this video shared on Twitter. 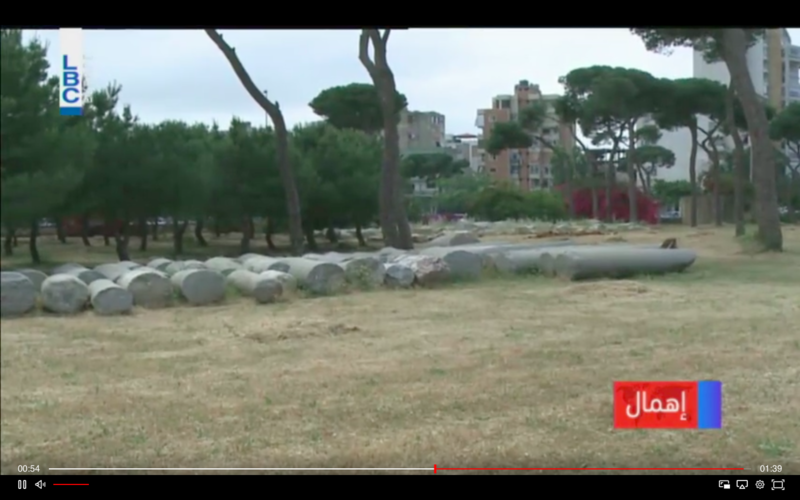 Minister Khoury, a surgeon with no background in archaeology according to his bio, said the ruins will be carefully moved to Beirut’s park, Horsh Beirut, seemingly as decorative pieces. 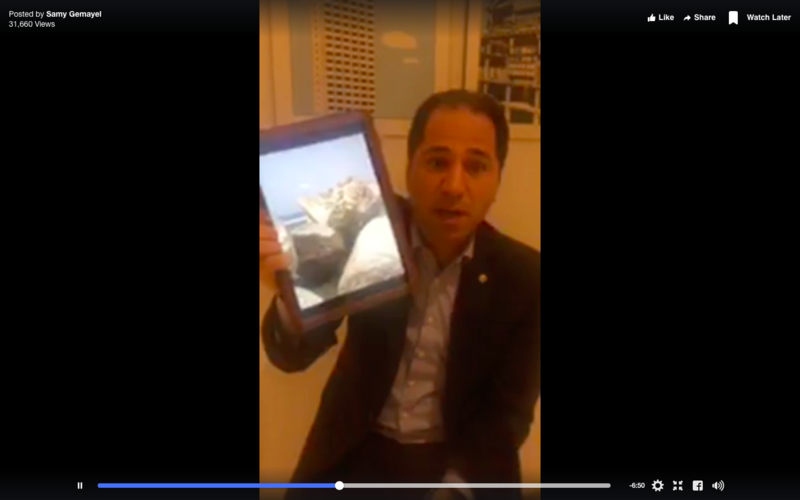 The minister rejected criticisms of the government’s handling of the ruins, vaguely laying blame at those who participated in the anti-corruption protests of last year “which led to nowhere.” He also took aim at MP Sami Gemayel who delivered a Facebook live video earlier in the week, angrily questioning the column’s placement after reading about it on social media, and likening the ministry’s handling of ruins to that of extremist groups destroying heritage. 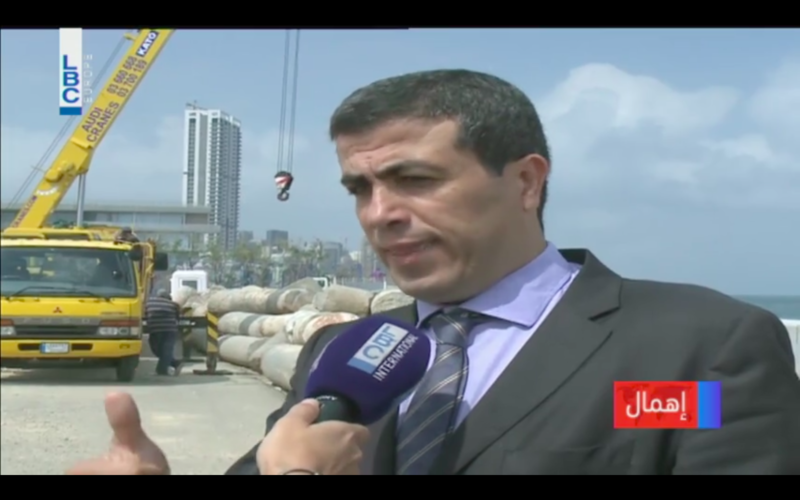 It seems Khoury was not referring to the yacht marina but rather the giant piece of legally dubious reclaimed seafront he was standing on, known as the “waterfront district,” Soldiere’s upcoming project, worth billions of dollars, as I had reported on previously. Thus the ruins apparently had to be moved to make way for more luxury real estate towers. But how is it that a private real estate company came to be responsible for housing and moving these ruins instead of the government? 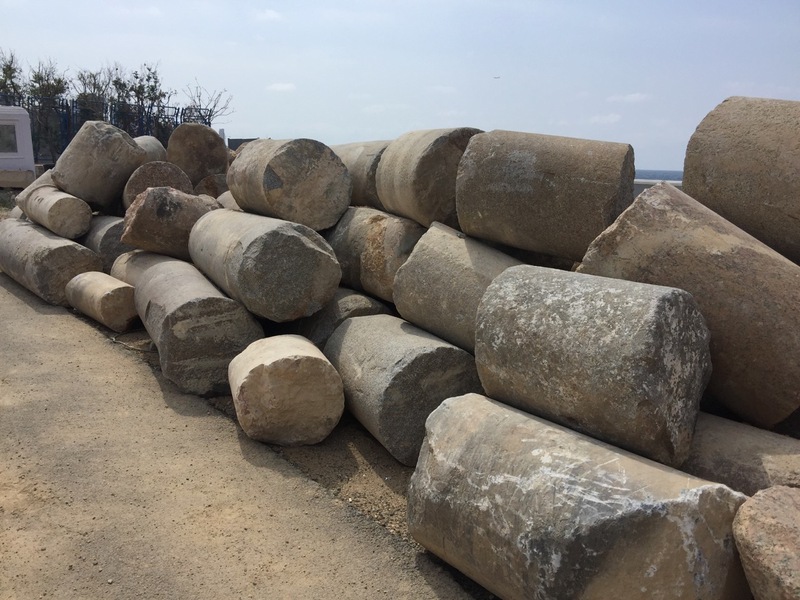 In many ways, the story of these columns can be seen as a metaphor for how archaeology has often been handled during the postwar reconstruction period. “They keep everything secret. 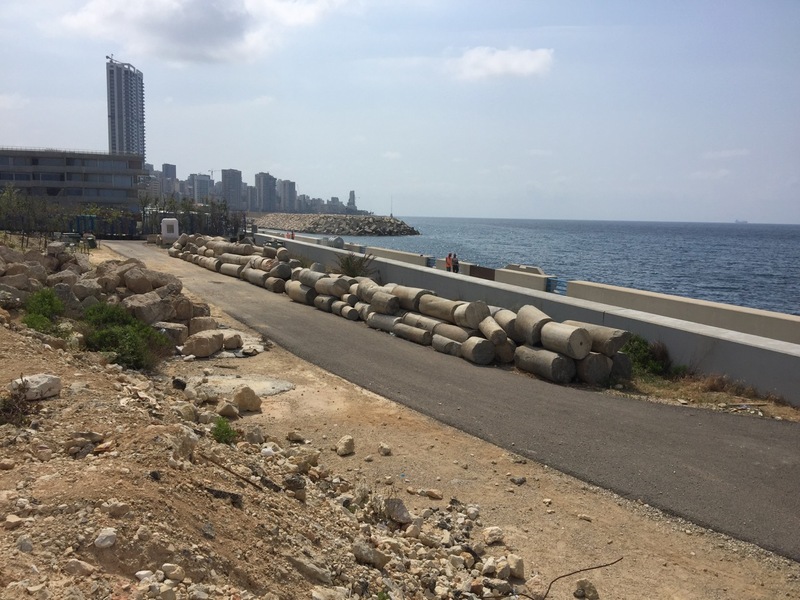 People focus on Beirut but they have no idea how many more substantial things are being destroyed across Lebanon,” said Professor Helen Sader. 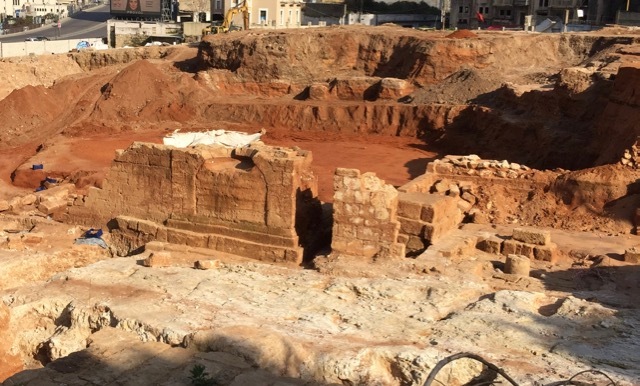 Since publication of the piece, the chariot race track has now been completely gutted to make way for a bank and luxury villas owned by another minister. 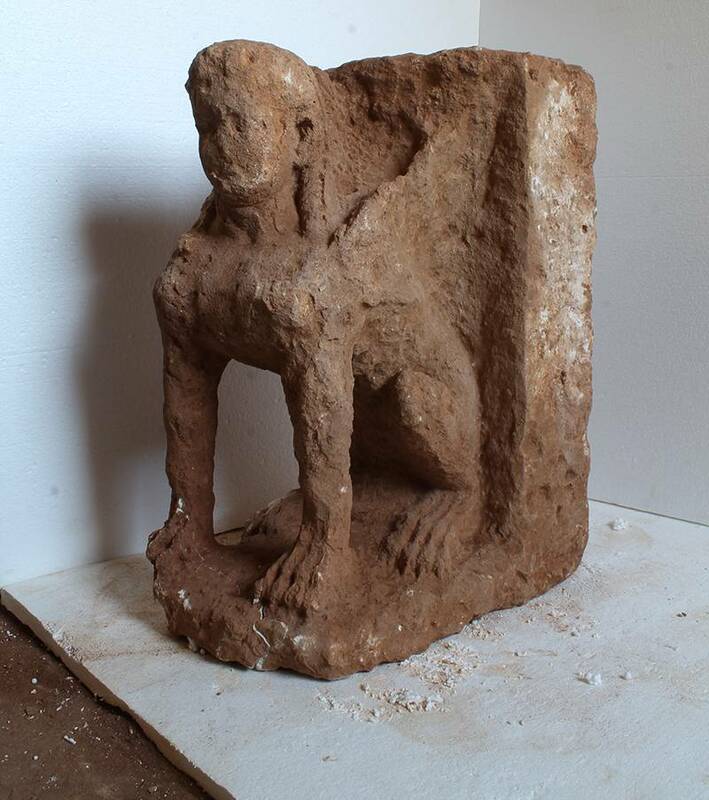 Meanwhile Solidere and other archeologists who worked for company continue to present their reconstruction and archeological preservation efforts as world leading at conferences in Lebanon and around the world. But with ruins tossed in a pile with no labels, something has clearly gone wrong. 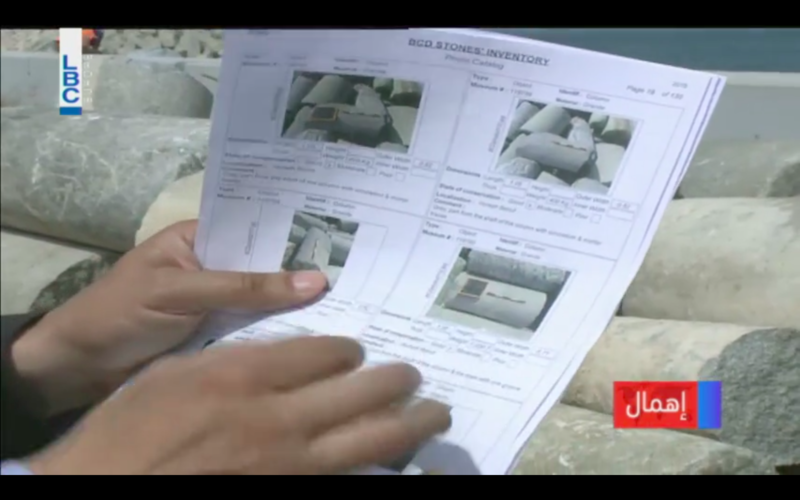 Perplexingly, the head of the antiquities department, Sarkis Khoury, claimed in a revealing LBC interview that as the columns are moved, each would be labeled according to its size and physical dimensions. 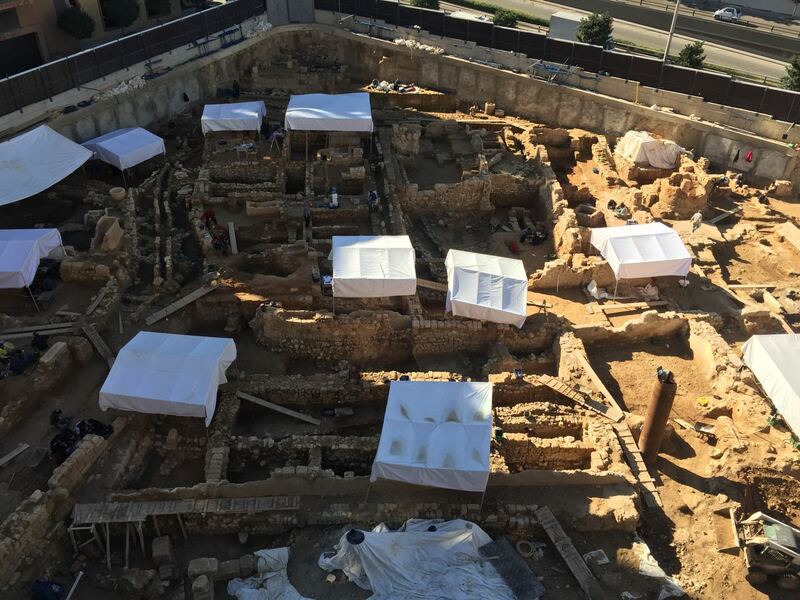 But why are the columns being labeled now instead of when they were first excavated? 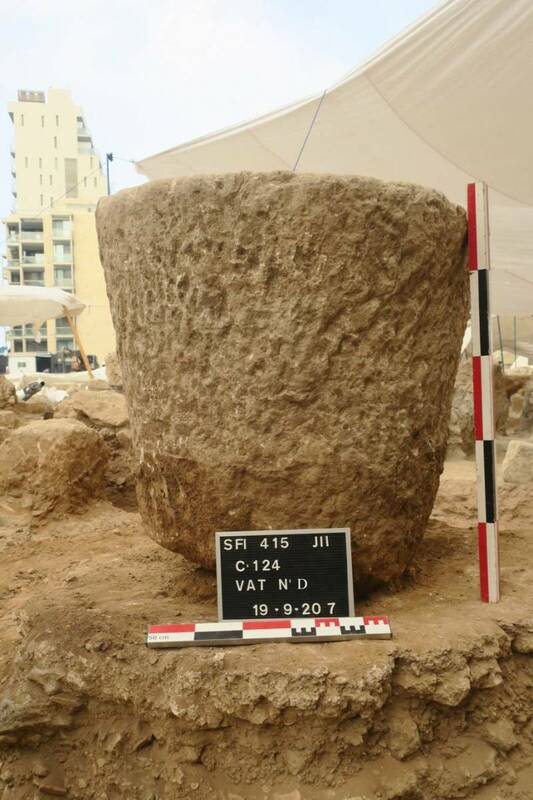 After all, it is not the length and height of the columns that tells their story, it is primarily the location where they were found, the archeological context, what structures or artifacts they were attached to and or found around them, that helps us date them and understand their usage. 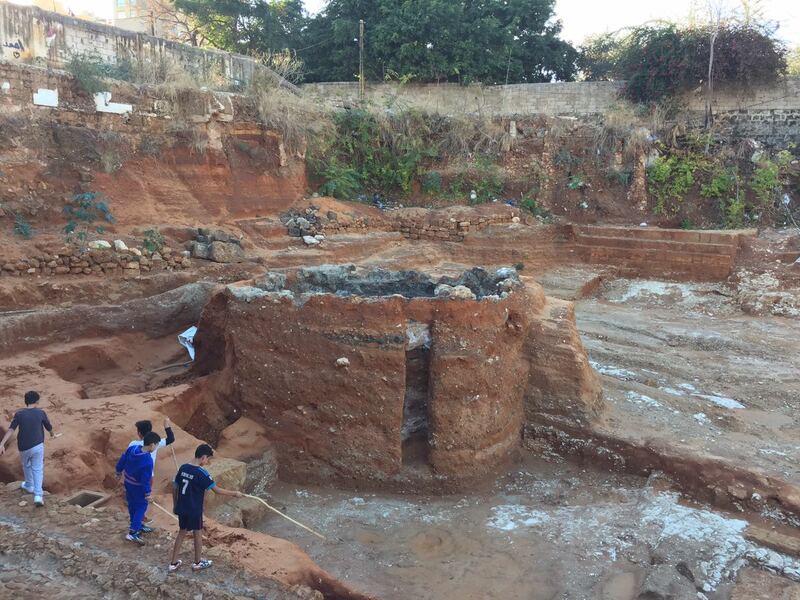 But now most of those excavations have been destroyed. 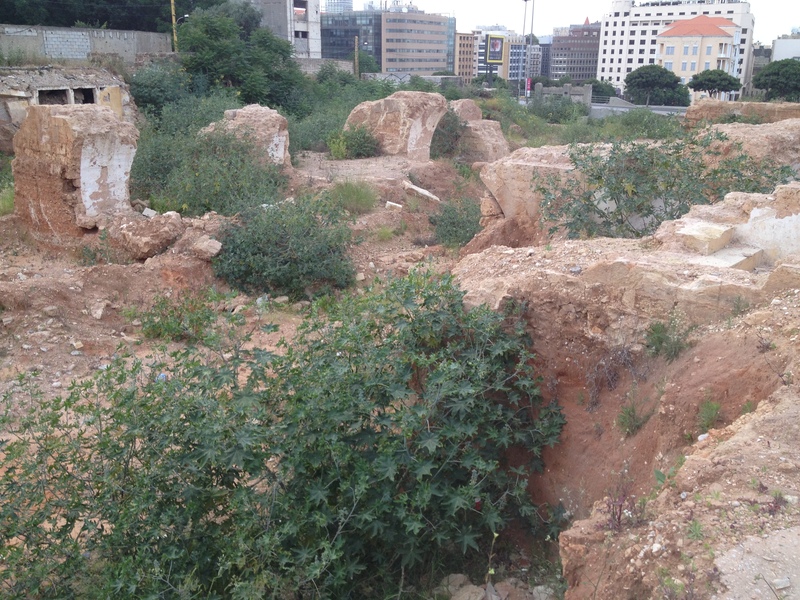 Director Khoury noted that the ruins would be distributed in gardens and public institutions across Lebanon “so the Lebanese people can benefit from them.” Many have already been moved to the city’s only park, Horsh Beirut. But does the public really benefit from columns with no identity? Columns that tell no story? Random slabs of granite laying on the ground with no meaning? 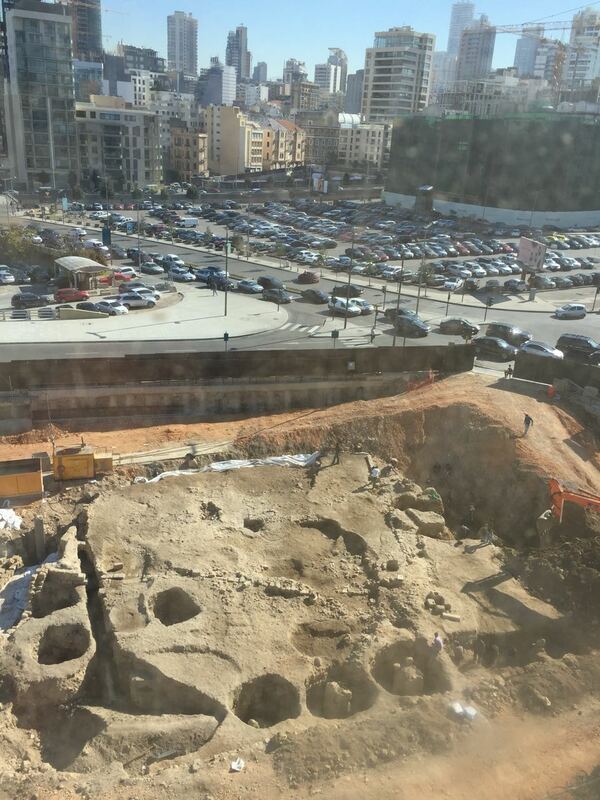 How did such a massive archeological effort end this way? 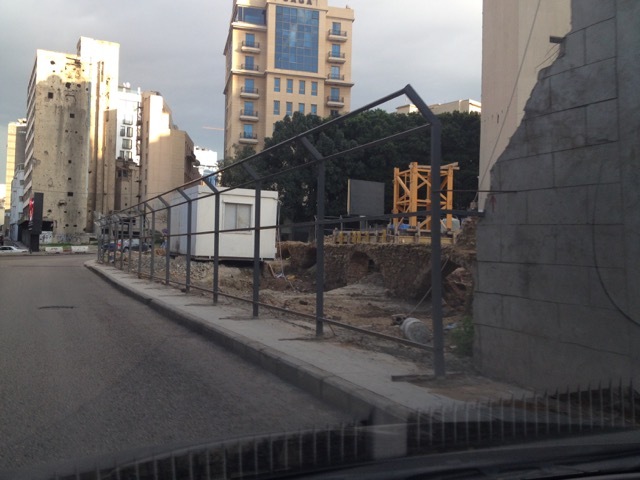 Why are the columns not being showcased across Beirut where they were found to give people a sense of the Roman city? 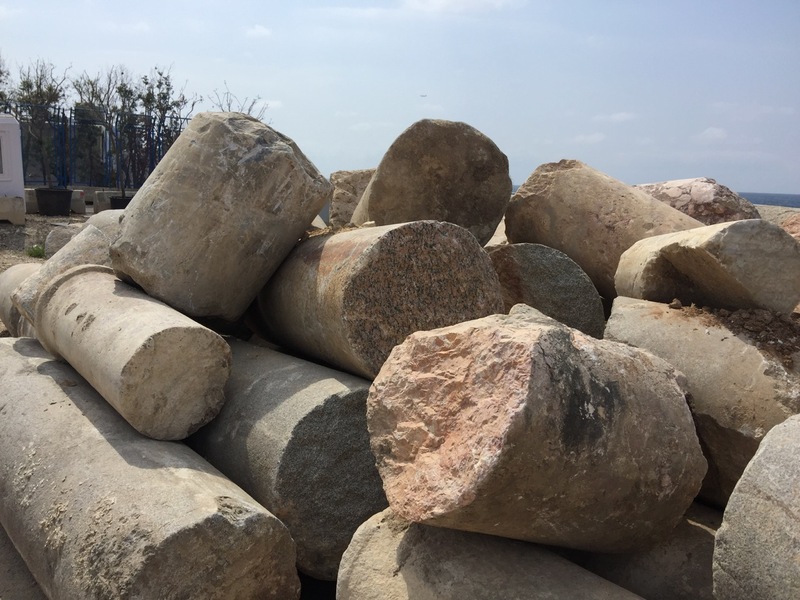 Some government archaeologists complain that the public does not appreciate history, but how can they do so if there are no signs or indications of what these stones and structures mean? I plan to get more answers to these questions in an investigative piece I am working on with the support of a crowd-funding campaign by Press Start. Your comments or suggestions are always welcome. In the meantime, one major thing has changed since the 1990s and that is social media. 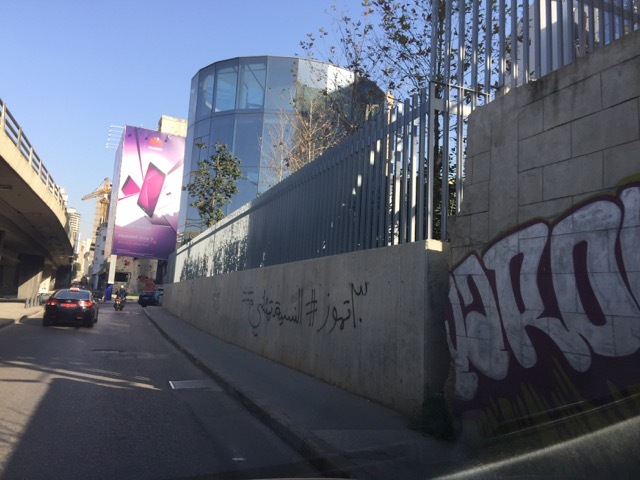 Posts by activist groups as well as prominent Lebanese bloggers such as Gino Raidy, Elie Fares and others have helped shed light on these issues, which were poorly covered by mainstream media in years past. But even the mainstream media is changing and becoming more aggressive in demanding accountability, as the reports quoted in this post by LBC’s Sobhiya Najjar and L’Orient’s May Makarem, show. 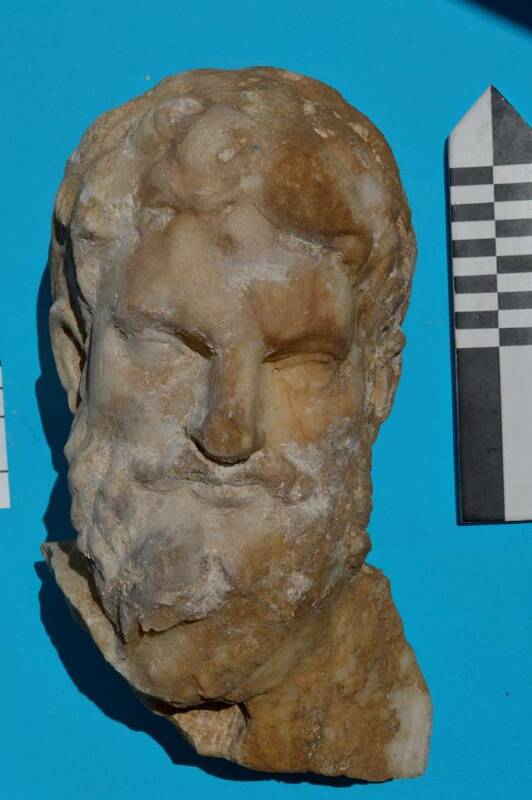 Going forward, let’s hope that with more media coverage and public debate, ruins won’t be brushed aside so easily in the future and we’ll be able to learn more about ancient Berytus as excavations and discoveries are likely to continue. 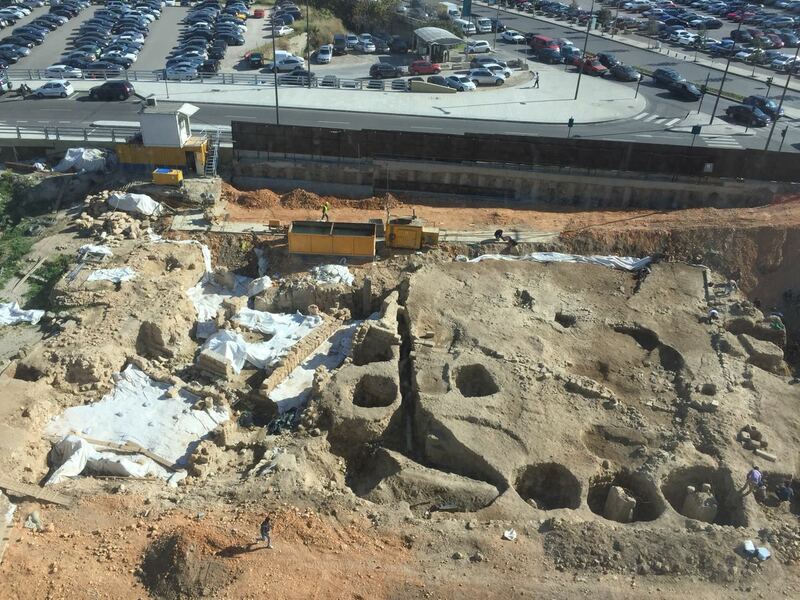 Upon a closer look: a row of small buildings is visible from recent excavations. They appear to be on platforms, interspersed with smaller podiums or column bases, and one seems to have steps:. 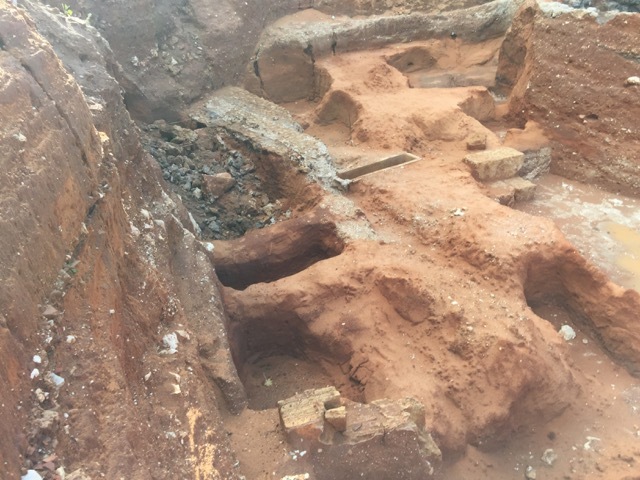 I’ve shown this image to some archaeologists who have mentioned the vaulted structure and what seems to be a smokestack in the background, could be part of an oven of sorts. 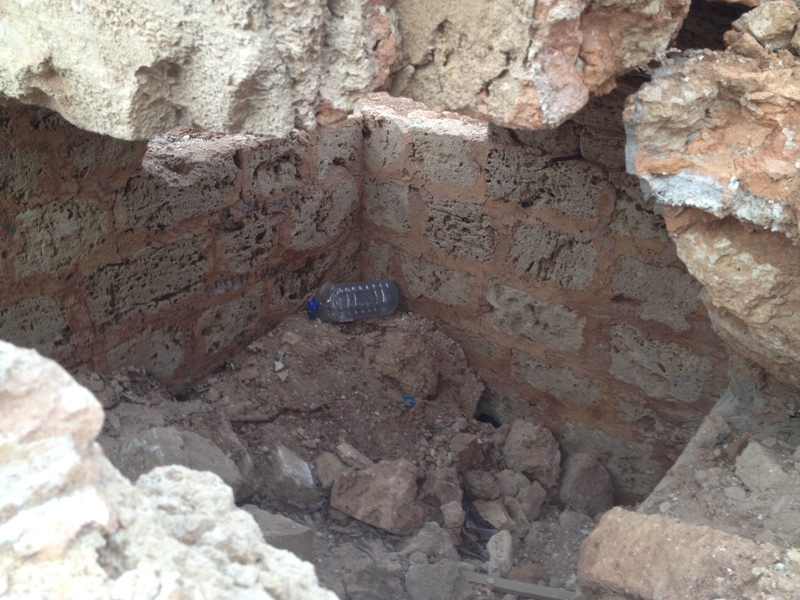 The assumption is that the site may have been used as a pottery factory. 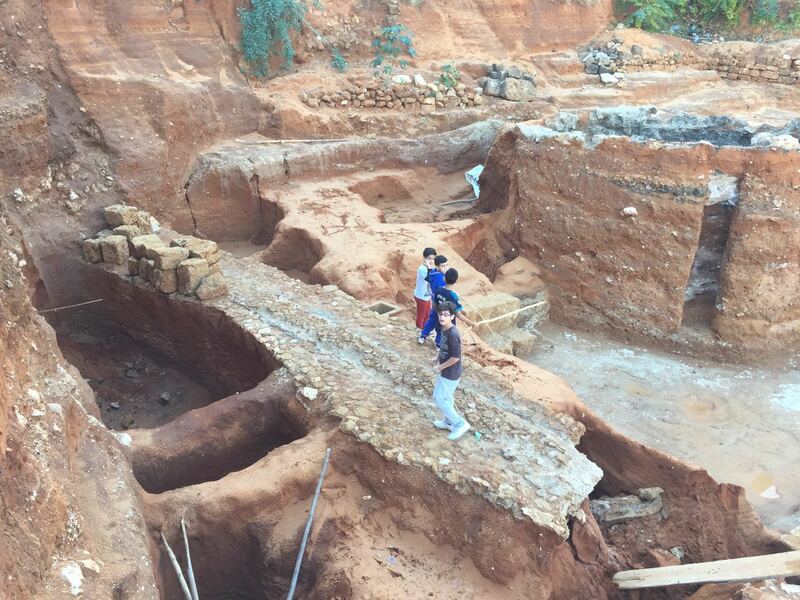 But this is just speculation at this point and we’ll have to wait for the archaeologists’ final report. From another angle we can see the front facade of the previous vaulted structure, which has an arch. 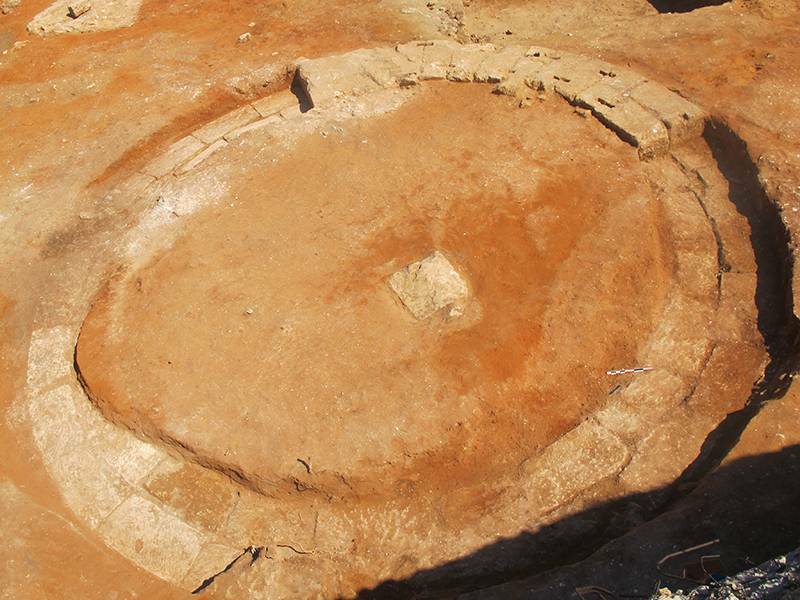 Here, we can see a closer view of both the circular and square bases of what appear to also have been small buildings. The one on the right appears to have column bases. 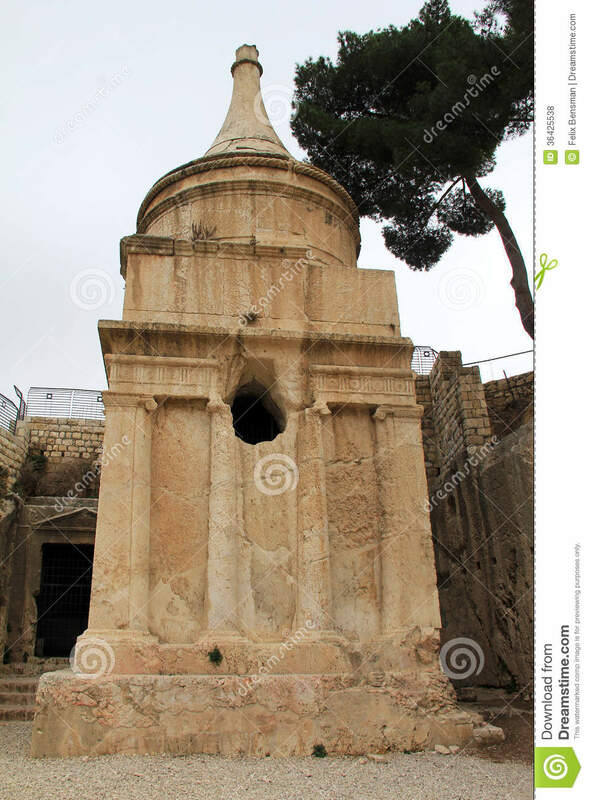 This is Absolom’s tomb in Jerusalem, not too far from Beirut and which some date back to the early Roman period, during which Beirut was prominent, so the time period and location are not too far off. I want to emphasize this is just my speculation based on numerous image searches and could be something entirely different and perhaps even more interesting. But there is much more to explore on this sprawling site. 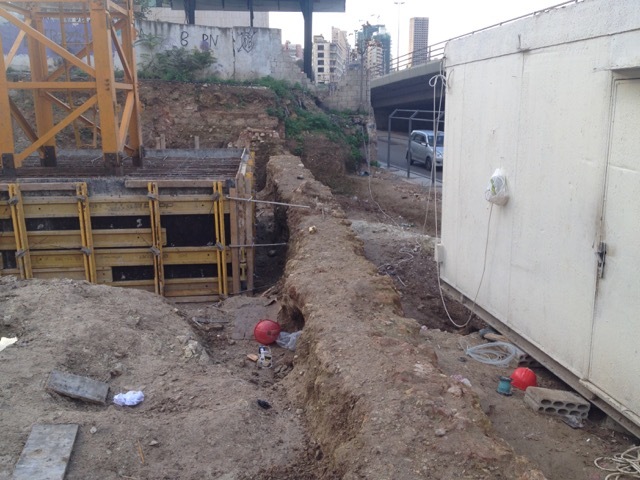 Could this wall link up with other ruins that are believed to make up the a city wall surrounding Roman Beirut? 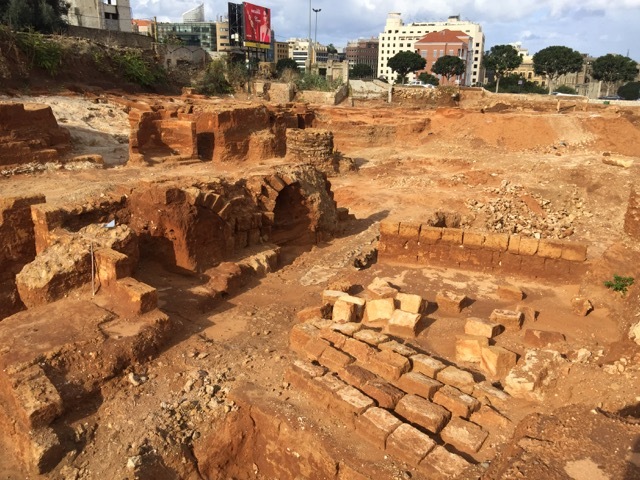 See previous posts on this site that exposed excavations on what some believe is the Roman Gate of Beirut, found only a few blocks north of here, as well as a wall-like structure found during construction of high rise in Safi a few blocks to the East. Will this wall help us draw a map of Roman Berytus or do these stones belong to an entirely different structure? What will happen to this site? 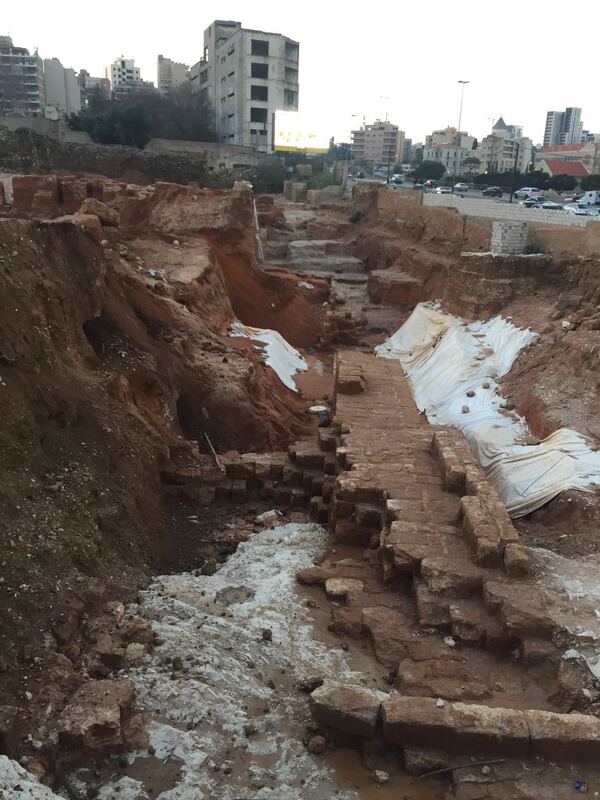 The only reason we usually have excavations in Beirut is because someone has purchased the land for a major real estate project. 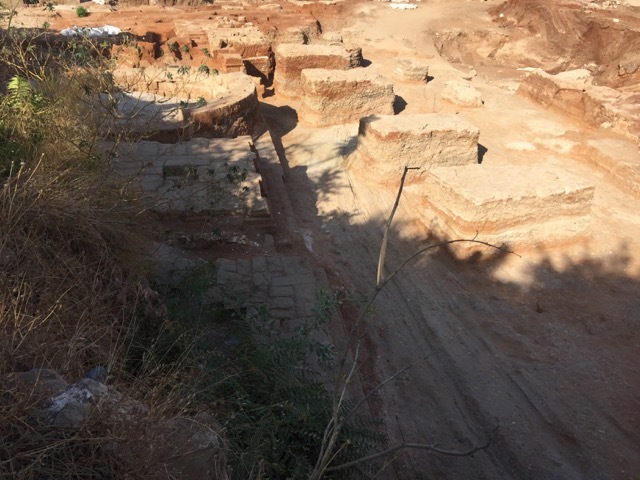 If ruins are found, by law the developer must alert authorities, allow archaeological excavations and fund those excavations until completion is determined to be complete. 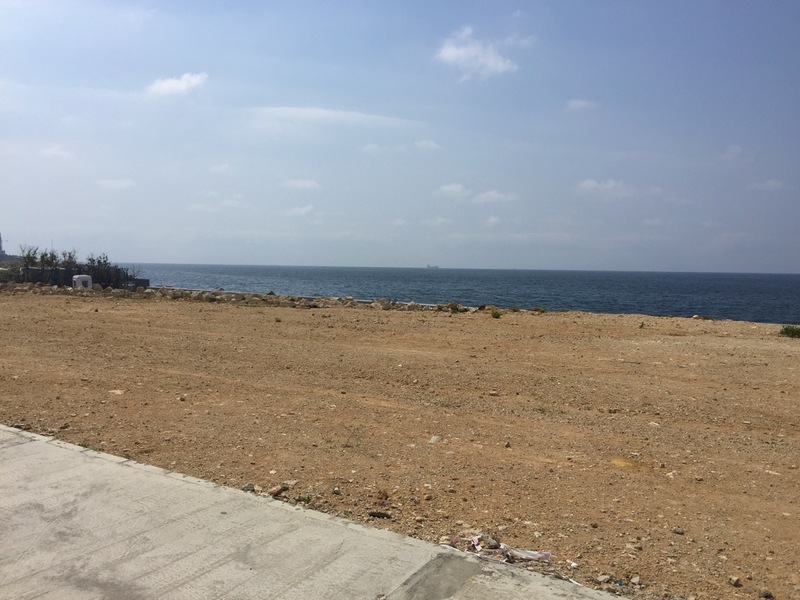 A decision is then made on whether or not the ruins will be kept in place, moved or demolished in order to make way for the real estate project. 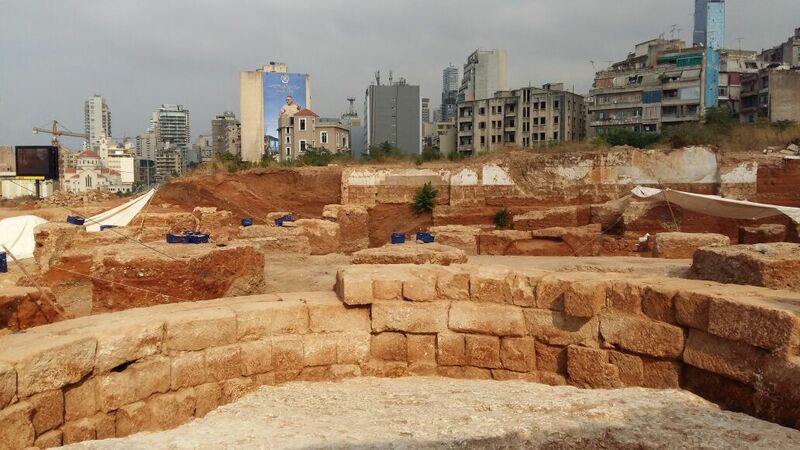 How that decision is made is often not a very transparent process and ruins found on many plots across Beirut have been cleared over the last few decades, such as the Roman chariot racetrack or Hippodrome of Beirut (documented on this blog) and which was gutted and is now the site of a luxury real estate project. The developer has promised to bring back a small portion of the ruins but it is unclear if the public will be able to access the site, as I reported for the BBC. Whatever the case, because the racetrack remains have now been completely razed, the public will never get to see the outline of the track, they will never be able to see the site in its original open air context, to understand its relationship to the city, to imagine what it must have been like to sit there, towering over ancient Berytus and watch the races. 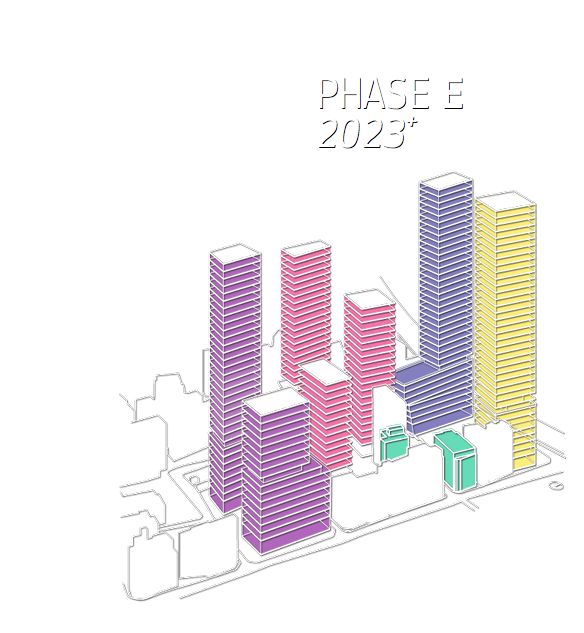 If all goes according to plan, the public will only glimpse a small portion of the stone wall in the basement car garage of a fancy apartment building, seen through a small window, if that window is accessible at all. In the past, I have been physically assaulted by developers and verbally threatened by a high-ranking government official for publishing pictures of ruins. But I believe the Lebanese public has a right to see these images. I believe all citizens have a right to see the history of their city or their country before it is rearranged, manipulated or cleared entirely to make way for yet another bland high rise structure– a cash cow for investors, but a loss of heritage and identity for the public, a potential tourist project to benefit small local businesses, a place for school children and adults to visit, learn dream and get inspired. So will the hippodrome scenario of clearing be repeated here? 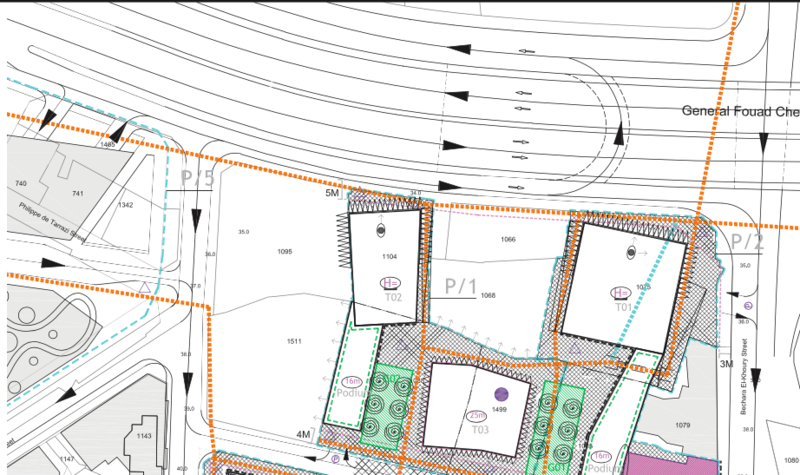 Or will the site be saved as was the case with the Roman Gate site, where construction was halted amid an intense public pressure campaign? 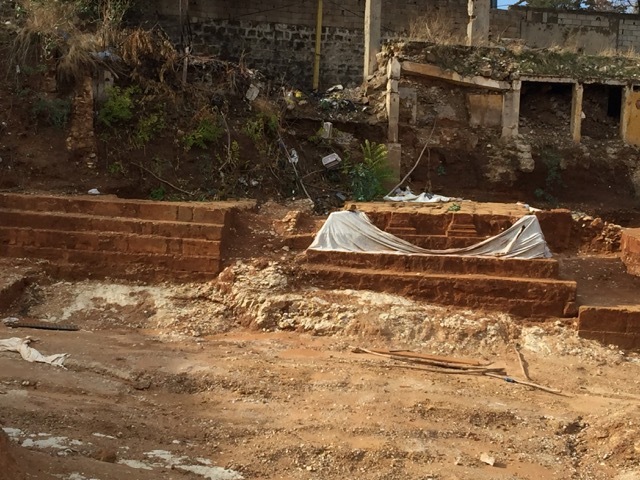 The abandoned plot was used as a playground for local children until it was purchased in 2007 by a real estate firm called “El Alia” according to Public Works research, and construction surveying began and heavy machinery arrived in 2013. Lebanese ministers have voiced support for the project, promising to offer subsidized internet and tax incentives to help make it a technology cluster to boost the economy. 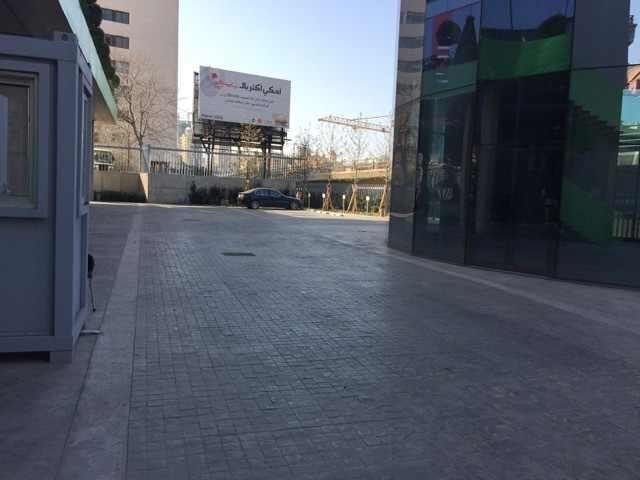 At the time of its launch, the telecom minister even claimed BDD would “heal the wounds” of the civil war and the project was fawned over by CNN as “Lebanon’s Silicon Valley.” Critics say the project is the same old high end real estate gentrification under the guise of entrepreneurship buzzwords and will only drive up prices in the impoverished neighborhood while offering rents far too expensive for struggling start-ups or any average Lebanese to afford. 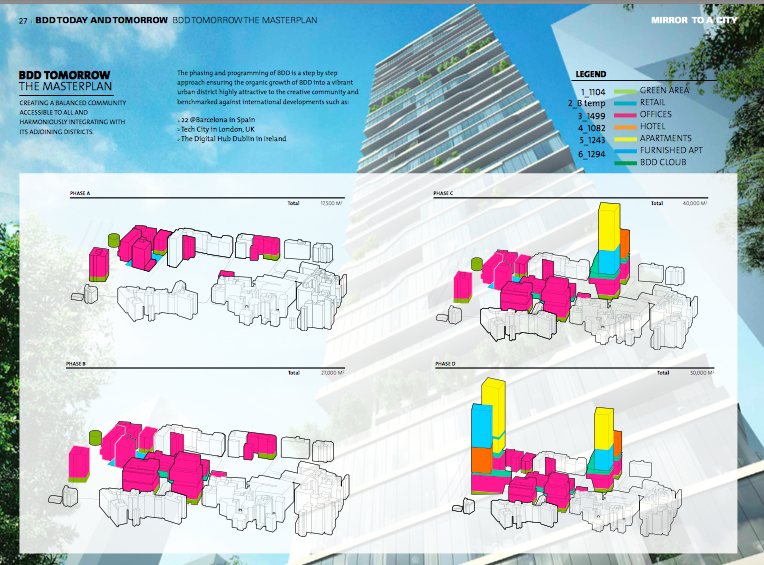 It’s unclear why this detailed map has been removed from the BDD website. Has this plan been abandoned? Or was this too much detail to divulge? 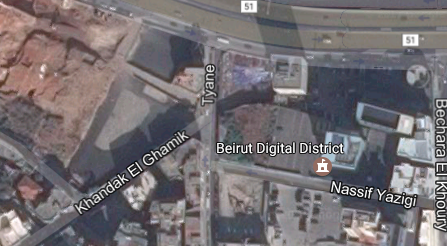 So is the ruins/hospital plot still part of the BDD project or is it owned by the El Alia company and is there any relationship between the two? 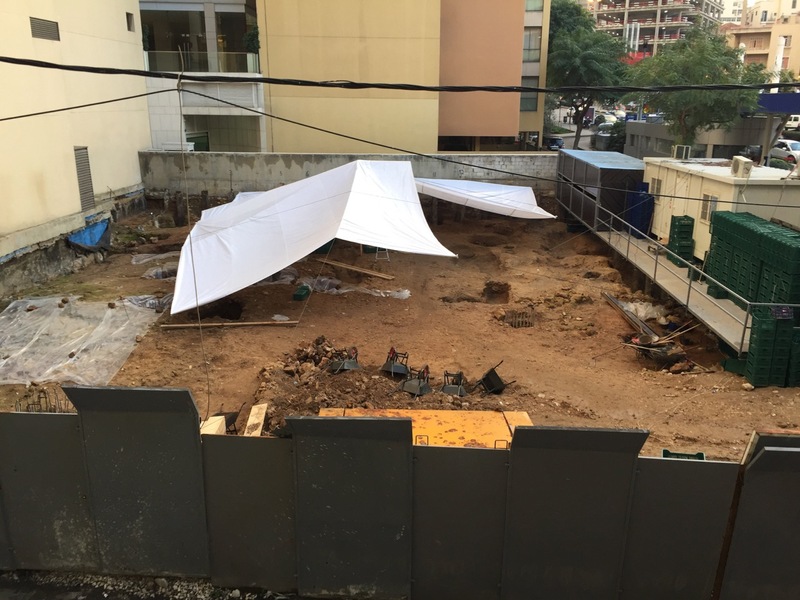 If the former is true, how would BDD handle the discovery of ruins on its property? 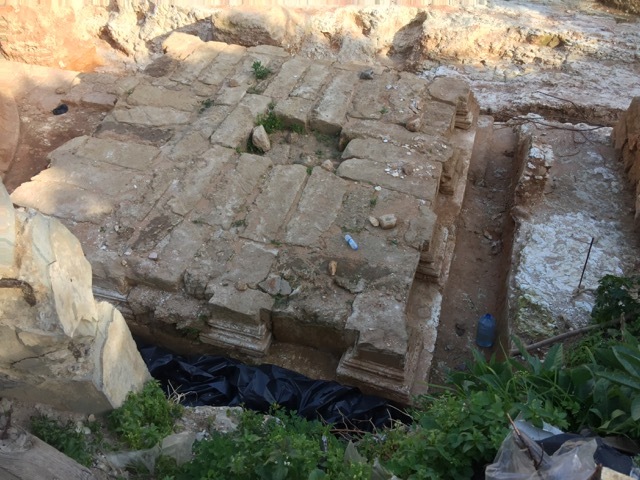 Actually this is not the first time ruins have been discovered on the BDD project parcels, which are being built only a few blocks away from the oldest prehistoric settlements of Beirut. Could these structures be related to those found on the old hospital plot, which is just down the street from BDD 1075? Or did they belong to a different civilization? We can see the parking lot is completely empty with no ruins visible on site. Were these ruins deemed not valuable enough to preserve on site? Was the parking lot weighed of greater importance than potential ancient structures? What happened to the ruins in that case? Are they in storage? Will they be displayed elsewhere? The bigger question is: Will the ruins on the old hospital plot meet a similar fate and become parking lots for BDD or another project? In the comments section of the post, I asked what BDD was doing for the local community in response to claims about destructive gentrification effects the project may have on the neighborhood. They answered by claiming the project is supporting 15 local families and helped rebuild a local public school. That doesn’t seem to be an extraordinary amount of public service for a neighborhood of thousands and also for the wide government support and tax and bandwidth incentives BDD is supposedly getting. 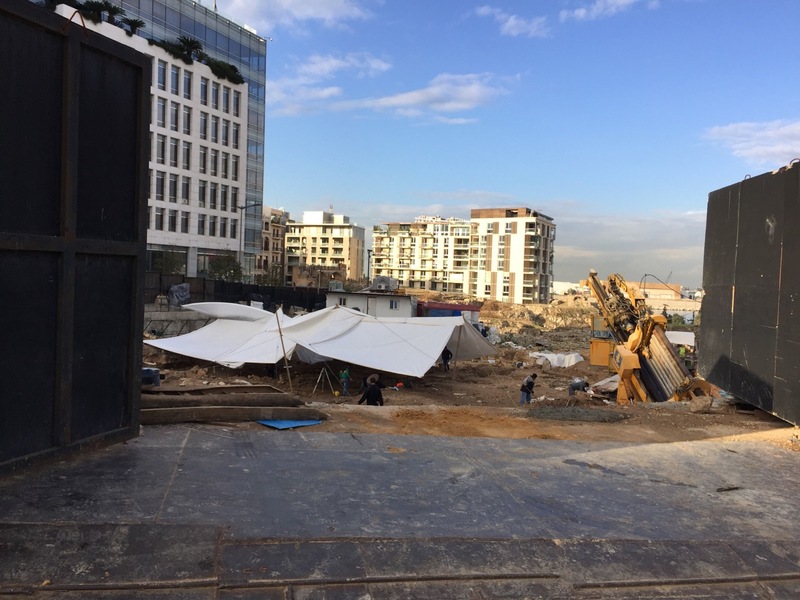 However it would be interesting to explore these issues further and to ask BDD if their pledge to support Lebanese heritage and history may be extended to ruins found on the plots they are now developing, which may likely also contain ancient structures. 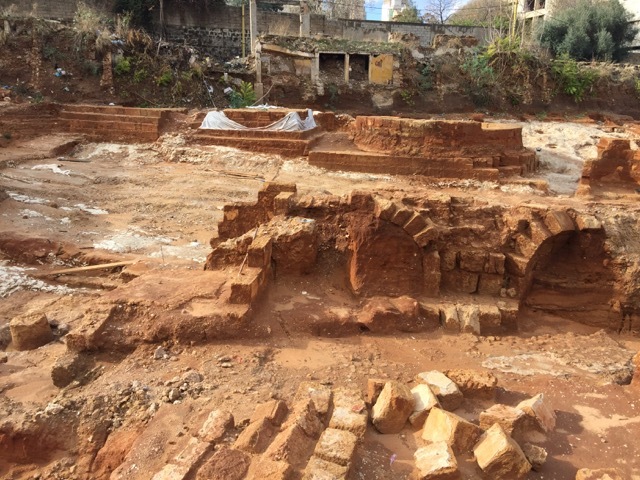 I hope to speak to BDD and other major Beirut real estate developers on their approach to preserving heritage as part of a crowd-funding investigative reporting project I have been working on with Press Start. 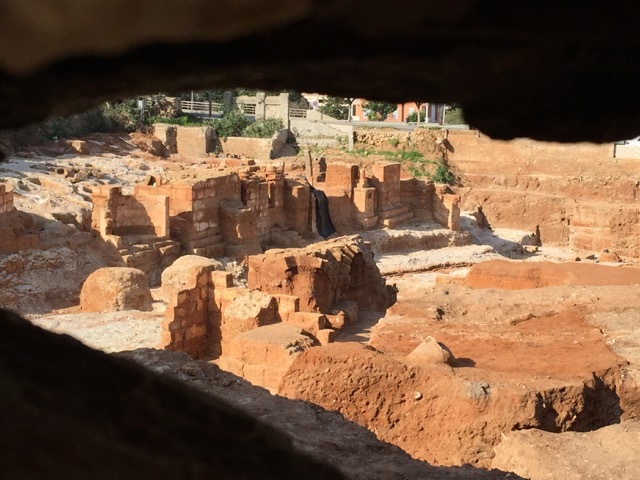 I also hope to speak to more archaeologists and government antiquities officials to learn how decisions are made on preserving sites, what happens to ruins that are removed from the ancient sites and what are the challenges of communicating these finds with the public. In the meantime, feel free to share these images and this post to help me get some answers. And If I’ve got anything wrong, I encourage responses from authorities or officials reading this who can help clarify the nature and status of these ruins. I will happily update the post with any comments left in the comments section below. 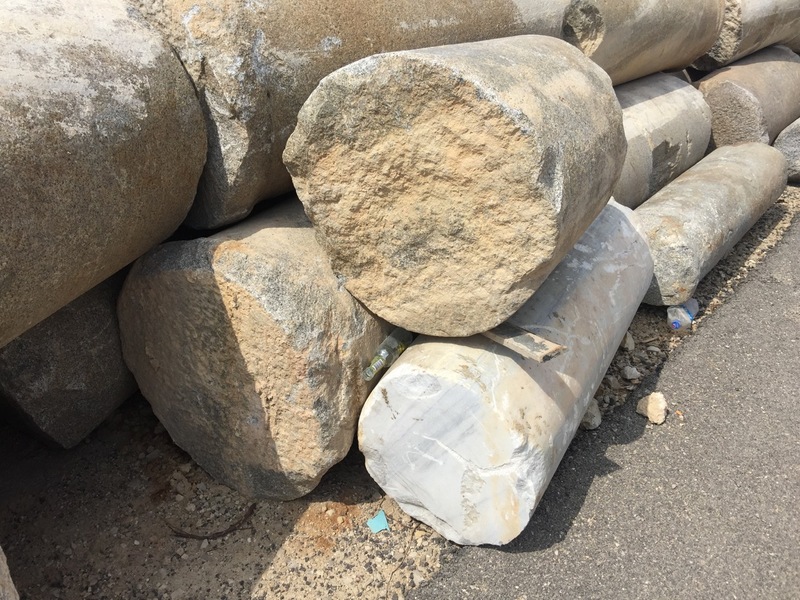 Shortly after completing this massive post, I noticed a story was just published by local French newspaper L’Orient Le Jour, detailing some of the finds. 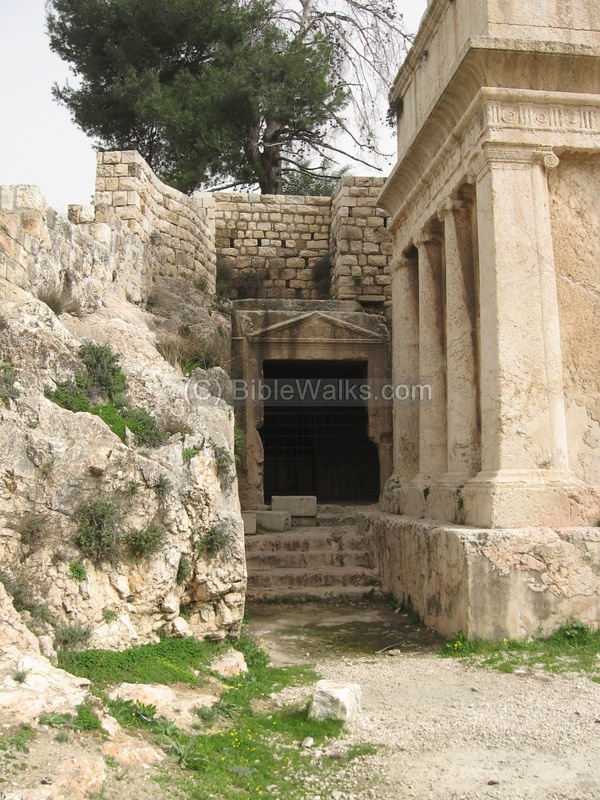 Indeed, it does seem the site is a burial ground or cemetery from the first century A.D. with some 250 tombs discovered! 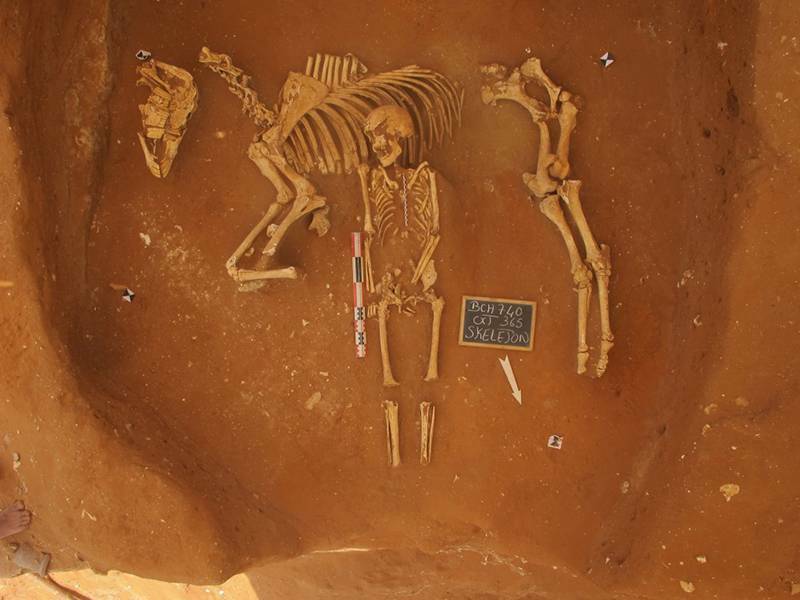 In one grave, a person is even buried with a horse, perhaps a sacrificial offering for getting around in the afterlife? 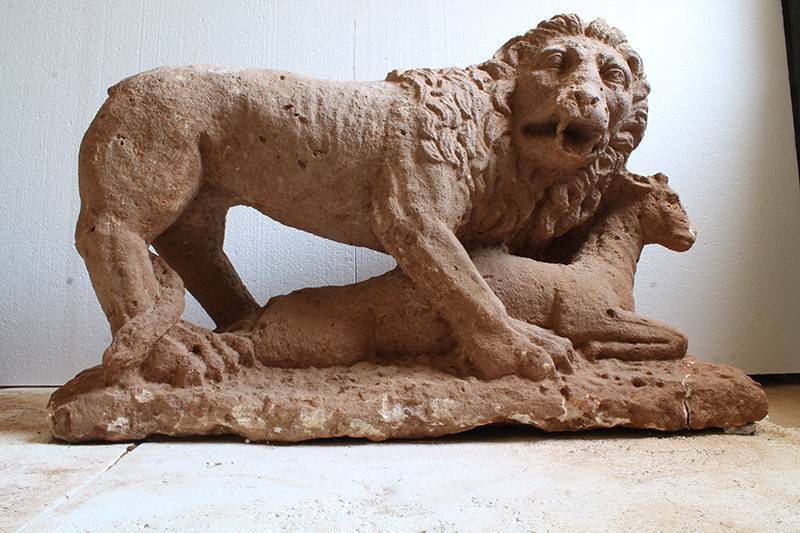 “The figure of the lion in a funerary context has an ancient oriental origin. It generally refers to a symbolic aspect. In the Roman world, and especially since the Augustian era, its representation is commonly used as a military iconographic icon that could indicate that the tomb was intended for a Roman veteran, “said Georges Abou Diwan, adding that the meaning of the figure of The lamb in this framework is being studied. 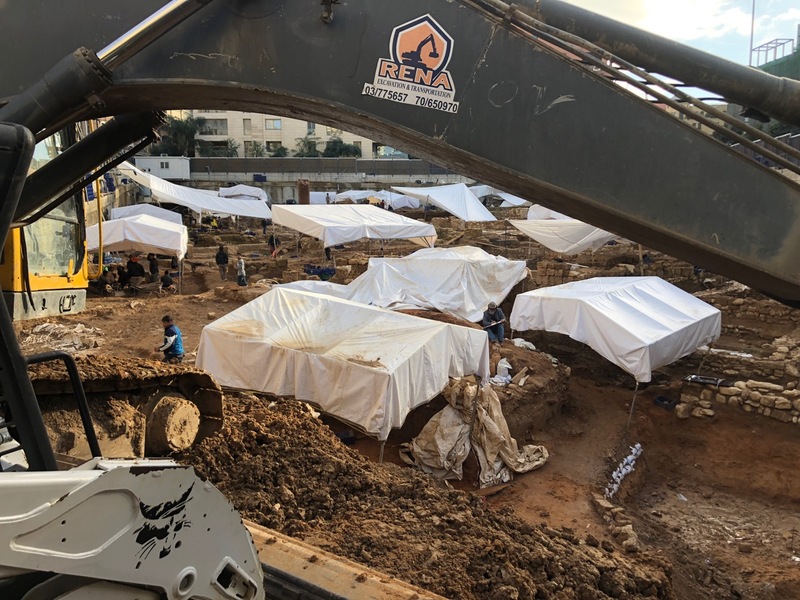 “The scientific methods used in this excavation have enabled archaeologists to better understand the chronological use of the cemetery, its development and the funerary practices adopted in Beirut during Roman times,” the specialist concludes. 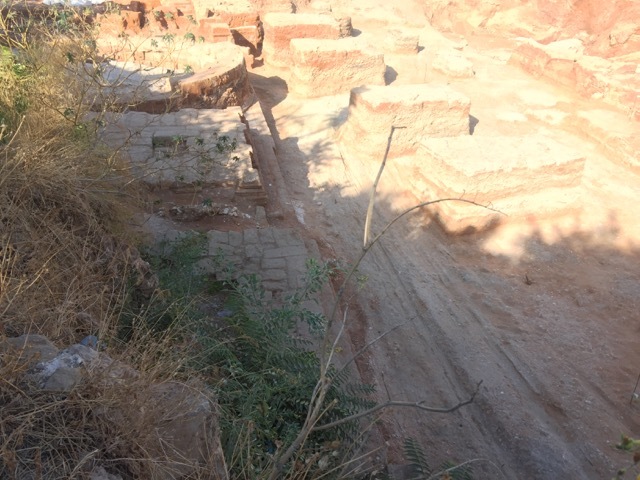 The L’Orient article is quite short and there is nothing yet on the big wall structure or the 12 column building, the other small buildings, the circular basin or the former cobblestone path that seems to have been washed away. So we will have to wait for the analysis on those. The article also doesn’t have any news on the future of the site, merely saying that excavations are due to continue throughout 2017. There are still a lot of lingering questions about the meaning and fate of this site. 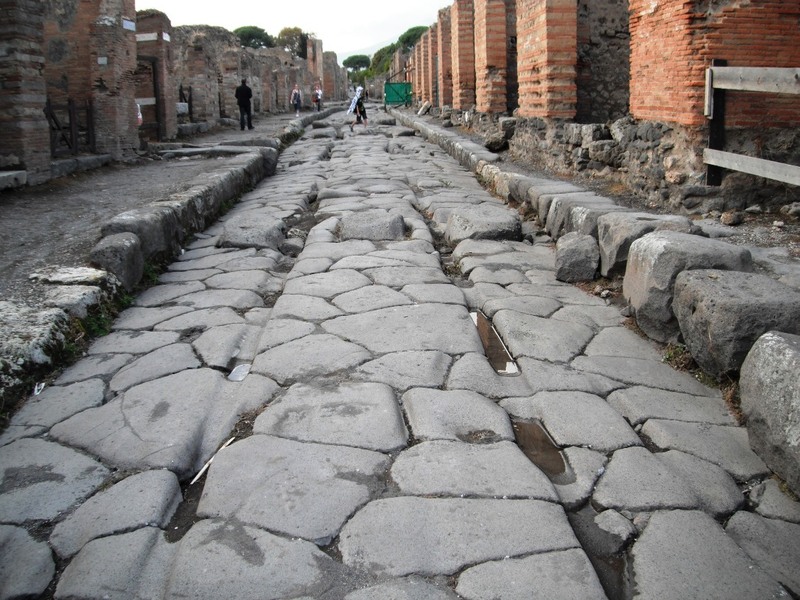 Could it be that the road to Roman Berytus was unpaved or do these tracks belong to another period or are they not tracks at all? I have recently been contacted by archaeologists from the site who have welcomed me to visit. Considering past violent experiences, I may need to take some friends along this time! But they assured me that things are changing and they want to be more open in the future. Let’s hope so for the sake of the city and the treasures many of us want to see preserved, shared and displayed. If you’re taking part in an excavation project in Sydney, check out mini excavator hire. 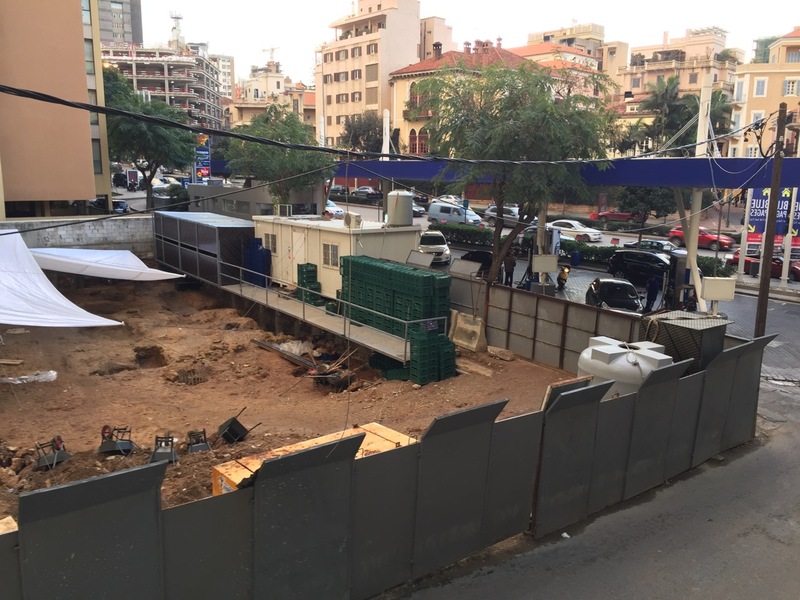 Can Seal help ‘legalize’ public performance in Beirut? A lot of you have probably seen the now viral cell phone video shot in the Beirut Souks mall earlier this summer. It’s a great pick-me-up, if you are losing hope in humanity (and in Lebanon and the Middle East in particular these days.) 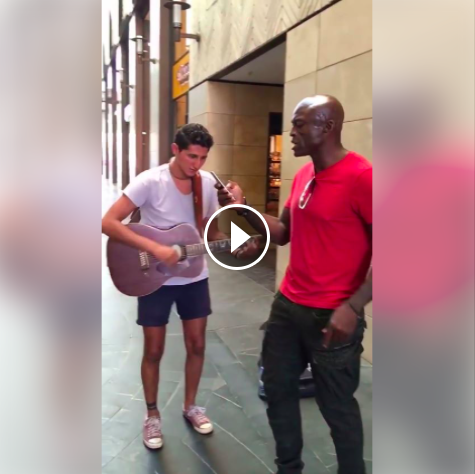 Spoiler alert: Grammy-award winning artist Seal sings a duet with the young street performer and ends by asking him to play at his concert later that evening. But what a lot of people who saw this video probably don’t know is that unscripted public performance is actually banned in “Downtown Beirut,” the part of the city that was rebuilt after the war by the private real estate firm Soldiere, which gentrified and commodified the old city center and ejected nearly all its old tenants, transforming the once gritty, centuries-old melting pot into a posh high street. I’m not sure if Seal got a hint of this, but he did note that it was “slim pickings” to find a busker or street performer in Beirut. This may be because performers have been manhandled and hauled away by security forces as I witnessed and documented in this post a few years ago. Seal also notes that despite Solidere’s offer of free-wifi (one of the many ways the corporation claims to give back to the city) the internet is actually “nonexistent” and thus he is forced to upload the video from his hotel room later on. Now Choucanii is not overly surprised to see Seal (unlike another street performer he encountered in Manchester who was starstruck) and Seal later admits from his hotel room that the performer was given advance notice that he was coming, which was not what he asked for. It’s hard to say to what extent this encounter was staged, but I wonder if the Solidere private security would have just stood back and watched if a famous star was not involved or if the street performer was not a good looking young kid singing in English instead of a poorer-looking Lebanese, Syrian or Egyptian singing in Arabic. And it’s not just the Souks. Other Solidere faux public spaces such as Zaitunay Bay have signs that explicitly ban unauthorized music, food or any type of public panhandling. Some of the greatest cities in the world are known for their street music. Why should Beirut be any different? Thanks to Marshall for reminding me about this video, which reached him as far away as Texas.